Lesina, known to the Romans as Alexina, is a small town of about 6,000 inhabitants located in the province of Foggia and an integral part of the National Park of Gargano. Essential for the development of the town is the homonymous lake or more precisely the lagoon as it is separated from the sea by a strip of dunes called Bosco-Isola and limited by two artificial sea channels: Acquarotta to the West and Schiapparo to the East. The length of the lagoon is about 22 km and its maximum width is about 3.5 km, over a total area of 51 km2. The economy of Lesina is essentially based on fishing activities that have always been the source of nourishment for its inhabitants over the past centuries, especially during the big famine. Lesina is in fact a town of trawl-nets, fish pots, harpoons, chestnut tree poles: fishing tools which used to contribute to a very flourishing activity in the past, to which is closely related the construction of boats suitable to sail the shallow lake beds; not more than ten years ago, the waters of the lake were sailed by squared-sail wooden boats. Another important element for the town's economy is tourism: several hotels and camping areas are present, especially in the sea fraction of Lesina Marina. In 1965, the film director Elio Piccon shot the documentary “L'Antimiracolo” (the anti-miracle) in Lesina and San Nicandro Garganico, in which he explains the still hard living conditions experienced in some parts of Apulia and the archaic organization until 1960's which characterized the local community, remained isolated from the Italian economic boom of that period. The documentary was awarded with the “Lion of St Mark” during the 26th Film Festival of Venice. 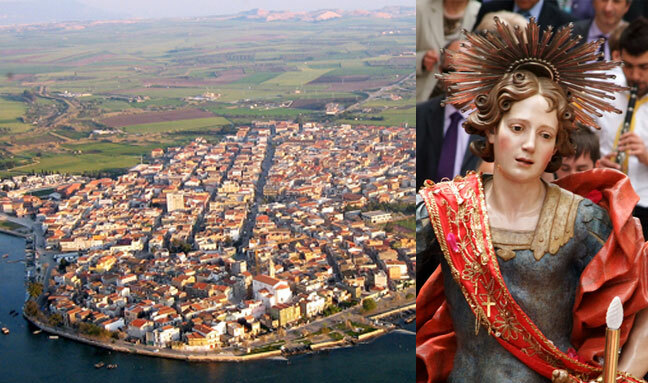 Today, Lesina keeps all of its ancient charm: the ancient village with its big cathedral dedicated to our Lady of Annunciation (SS. Annunziata) and the bishop's palace dating back to the 1200, everything reminds of ancient times when the village used to live out of fishing. In the museum room dedicated to the scholar “Raffaele Centonza” are shown finds (retrieved during to the archaeological excavation carried out following an algal reclamation) buried underneath the loamy sediments of the lagoon bed and belonging to seven graves. They were excavated into the limestone rock and contained grave goods dating back to the 8th and 4th century b.C. The patron saint of Lesina is St Primianus Martyr celebrated on the 15th of May of every year during three days of solemn celebrations in his honour.